We're just two weeks into 2018... how's it going? Have you set your goals for the year? If so, are you still motivated by the goals you set? No doubt you've been thinking of ways to grow your business and brand this year. Remember to set SMART goals (Specific. Measurable. Achievable. Relevant. Timely.) and outline the tools you need to meet and exceed them. 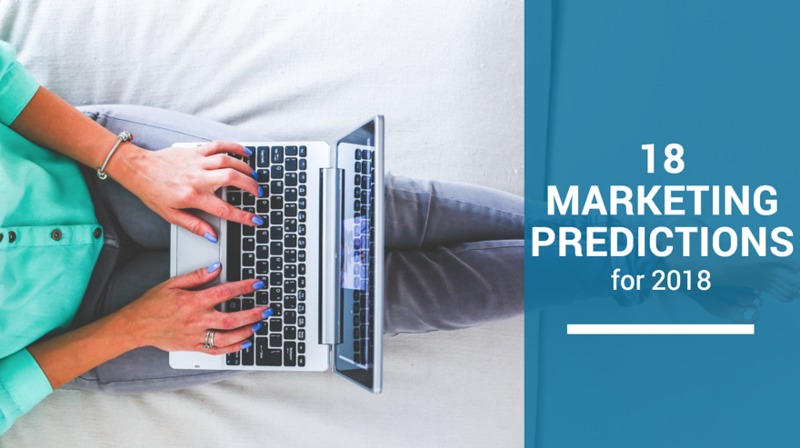 In an effort to help you set and execute your marketing plan for 2018, we're sharing these 18 marketing predictions for the coming year, courtesy of Sarah Corley from WSOL. She asked the IMPACT Elite network to share their marketing predictions for inbound marketing, social media, SEO, email marketing, video marketing, marketing automation and HubSpot in the year to come. Check out what 18 marketing experts (including our very own Todd Laire) had to say! We hope this helps you find the tools you need to stay on top of the upcoming marketing trends and achieve your goals. Click here to subscribe to get our newest articles straight to your inbox. 1. Content marketing for small business will become even harder. It'll mean a larger dedication to content, inbound from an organization level, and differentiation / value that can't be found anywhere else on the web to find success. Many company will have to go way beyond what they're currently doing. 2. Companies without video will feel inherently untrustworthy in 2018. We'll expect to be able to see the faces and hear the voices behind the brand or business we're working with. If people can't find that, trust is destroyed. 3. If you aren't already utilizing social video, it's time to jump on that bandwagon. Instagram and Snapchat stories will be crucial to your digital marketing strategy in 2018. The decorative tools give you the chance to show your creative side and add more personality and flair to your platform! 4. Small businesses will have more (and cheaper) sales and marketing software. There’s a lot of competition in sales/marketing/service software now, which will drive prices lower and make it easier for small businesses to align and add value to their customer-facing efforts. You’ll see some very capable and affordable alternatives to HubSpot and Salesforce emerging and gaining traction. 5. Your visual content will be less effective if you don't use user-generated content. I predict that with the flood of curated content that brands who don't adopt either true user-generated content or the style of user-generated content will find their visual content (video & still) less effective. Consumers are looking for authentic and relatable content. 6. 2018 is the year of marketing and sales alignment. Instead of each team operating in their own bubbles, they will collaborate effectively to produce better results. Lead hand-off from marketing to sales will be defined. Sales will report on lead follow-up giving marketing a better understanding of what leads are likely to become customers. Better info = better marketing campaigns = better leads = more customers. 7. Facebook's focus on messenger is going to drive more companies to invest in chatbot marketing. In the last few years we've seen Facebook drive a lot of the marketing trends that we focused on. Their new focus on messenger is going to drive more companies to invest in chatbot marketing in a similar fashion as they now use email marketing funnels. 8. Long-form PDF lead magnet will continue to decline in effectiveness. Why? Because of waning attention spans and the fact that no one reads them. Lead magnets that will gain traction: (1) Snackable video content: gated series of 6-8 videos ranging from 2-6 mins answering a specific question around 1 topic. (2) Secondly, the 'deconstructed eBook,' the idea of taking an eBook and dumping its contents onto a UX-friendly page. 9. No longer will it be enough to simply communicate with your leads and prospects. Each person will expect a personalized approach in marketing efforts. More than ever before, personalization will be key to growing your business. 10. Content will need to take a more insightful/conversational turn and be less about gaming search engines. We hear so often that pages need to be longer, more detailed, etc, but that can only go so far. Distribution and return traffic depends more on the unique value you can provide. Content has to go beyond just the facts and best practices and offer more thought-provoking insights to grab people long-term. Search-friendly pages/articles will always have a place, but "thought leadership" pieces should be given more priority! 11. Inbound won't just help you get sales leads; it will help you get talent leads too! Not only will more companies / business owners / organizations adopt an inbound marketing strategy for attracting new clients etc in 2018 but they will also utilize inbound strategies for attracting talent to join them as well. Sourcing and hiring candidates for employment and contract work via inbound creates search & website traffic, lead conversions, engagement & social proof, feedback and list building just like it does for running campaigns for leads and new clients. Our biggest months for traffic, leads and securing new clients directly correlated to our efforts promoting that we had open positions and using inbound to amplify it. Todd Laire, Laire Group Marketing ← That's us! 12. You've got to get smart about your business email. If you're not using list segmentation, personalization, and smart content in your email marketing strategy, you're starting 2018 already behind. 13. B2B marketing will rely on account-based marketing techniques. Account-based marketing and inbound marketing will join forces to rule B2B client acquisition in 2018. 14. Podcasting will begin to explode. With it becoming more mainstream (Google Play, Spotify, iHeart Radio) more listeners will be tuning in. People who fear video but want to get in the game, well, that equals podcast hosts. Podcasting allows us to be honest, authentic, humans solving problems on a weekly basis for great communities. 15. Personalization is expanding - have the right tools in place so you aren't missing out. Autonomous personalization will expand beyond the eCommerce context and into contextual content personalization. 16. Your messaging needs to be to your personas about their pains. As we enter 2018, marketing will continue to become less about the product/service and far more about understanding the audience and building strategy around that. 17. Gifs & Boomerangs are only going to get more popular. Video will continue to rise as a top social engager - so expect to start using more gifs, boomerangs, and stop-motion in your social marketing. 18. More brands will use interview marketing to get quality leads. Podcast interview marketing will grow, putting brands in touch with ideal listeners hungry for connection.